On the movie front, Jason Momoa starred in the rebooted “Conan the Barbarian,” “Parks and Recreation’s” Aziz Ansari got to co-star in “30 Minutes or Less,” and Vanessa Hudgens and Jamie Chung got some play in “Sucker Punch.” But none did well at the box office. On the other hand, Justin Lin, whose “Fast Five” was one of the biggest blockbusters of the year, got a two-year “first look” deal with Universal Pictures, and one of the projects he hopes to make is on the 100th/442nd. Harold and Kumar returned for their third film, which did almost as well as the second one, but wasn’t as funny. Tadanobu Asano was cast as Hogun, one of Thor’s Mighty Three back-up team, and Ken Jeong went “full monty” again (yay?) in the second “Hangover” movie and did a funny job hosting the Billboard Music Awards. In March, the world watched in horror as a 9.0 earthquake gave birth to a tsunami that drowned thousands in northern Japan. Many Japanese Americans, who spent generations distinguishing themselves from Japanese nationals, felt a sense of pride as our Asian counterparts conducted themselves in amazingly honorable ways, still thinking about society as a whole and not just about themselves even in such a horrific disaster. People across the world gave pause to consider then salute these Japanese values. And it was reassuring to see Chinese celebrities like Jackie Chan hold fundraisers to help Japan, despite the country’s historic controversial relationship with its Asian neighbors. Here, in chronological order, is my assessment of the media issues and events that affected Asian Americans in the past 12 months. January: Sh*t-Stirrer Award to Amy Chua, whose “Battle Hymn of the Tiger Mom” became a runaway best-seller and spurred debate on the best way to raise disciplined, successful children. The author, who didn’t allow her children to watch television or have play dates with their peers and forced one of her daughters to practice piano for five hours without a bathroom break, came off as a lunatic. Yet many non-Asian mothers wondered if there was something they could learn from her approach. “The Green Hornet” stars Canadian funnyman Seth Rogen and Taiwanese pop star Jay Chou. One Step Forward, Two Steps Back Award to the producers of The Green Hornet. Although Kato was allowed to shine by being the real brains and brawn behind the crime-fighting team and attracted the secretary (Cameron Diaz) of Britt Reid (Green Hornet’s alter ego), the film was marred by the accented/congested nose of Taiwanese actor Jay Chou. Next time, use an Asian American. Oh, and point out that Kato is pronounced KAH-toe, not KAY-Toe. February: Bachi ga Ataru! 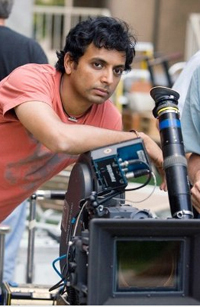 Award to M. Night Shyamalan, whose controversial, white-washed movie “The Last Airbender” swept the Golden Raspberries (“The Razzies”) winning for Worst Picture, Worst Director, Worst Screenplay, Worst Supporting Actor (Jackson Rathbone), and Worst Eye-Gouging Misuse of 3D (the organizers hated this film so much, they invented this category in its honor!). March: Sh*t Stirrer II Award to UCLA junior Alexandra Wallace. In her “Ching Chong Ling Long Ting Tong” YouTube video, she complained about “hordes of Asians” invading her school. It led to death threats, many video responses, an apology, and her leaving the university. Jimmy Wong’s “Ching Chong (It Means I Love You)” video not only became a viral hit, his parody song sold 2,000 downloads and debuted at #7 on Billboard magazine’s Comedy Digital Songs chart. Hypocrite Award to “American Idol” judges Randy Jackson and Jennifer Lopez, who repeatedly criticized 16-year-old Thia Megia for constantly singing ballads (“Out Here On My Own,” “Daniel”) — even though she did them well — while raving about Scotty McCreery even though he sang the same old traditional country song week after week. Eventually, he came out on top, becoming one of the worst winners in the history of the singing contest. A screen shot of Alexandra Wallace from her YouTube video rant, "Asians in the Library." Didn’t You Learn Anything From “The Last Airbender”? Award to Warner Brothers for trying to hire white actors to play the main characters of “Akira” (which also features Japanese names like Kaneda and Tetsuo) for their live-action film version of the manga-based property. April: Arigato Award to Jen Bresnan, senior VP of alternative programming for CBS, for featuring two Asian American CEOs in back-to-back episodes of “Undercover Boss.” Baja Fresh CEO David Kim tearfully related to the struggles and dreams of some of his workers, who, like him, are immigrants. J.D. Sun, who started BrightStar Cares with his wife, provides relief for people caring for sick relatives. That second episode finally showed viewers something they never see in scripted series: A Filipino nurse! 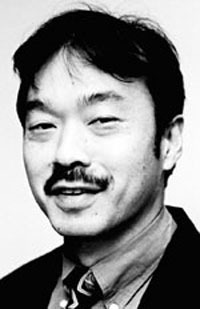 Advocate Award to “Fast Five” writer/producer Justin Lin for allowing Han (Sung Kang) to “get it on” with fellow teammate Gisele (Gal Gadot), though it would be nice to see more Asian Americans populate the “Fast and Furious” franchise as Asian Americans started the import car culture in the first place. 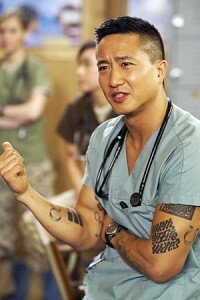 June: Arigato II Award to the producers of ABC’s summer series “Combat Hospital” for casting two Asian doctors as regulars who later have a sexual relationship. Arigato III Award to “Captain America: The First Avenger” screenwriters Christopher Markus and Stephen McFeely for acknowledging the participation of the 100th/442nd in the battle in Europe by including the humorous Jim Morita (Kenneth Choi) in the superhero’s Howling Commandos, though the name of the battalion and circumstances of their fighting for a country that put them in concentration camps was not spelled out. September: Bachi ga Ataru II!/Failed Experiment Award to “The College Experiment.” Host Bob Oschack interviewed only Asian-accented USC students who knew nothing about the Pac 12 conference, perpetuating the notion of Asians as foreigners. After complaints (including from your truly), the Fox Sports show, which had just debuted the previous week, was cancelled. October: Arigato IV/Public Service Award to the producers of “Glee” for the “Asian F” and subsequent episodes that focused on the dilemma of Mike Chang (Harry Shum, Jr.): Give in to his father’s expectation that he become a doctor or pursue his own dream of becoming a professional dancer? Though some feared “Tiger parents,” both Mom (Tamlyn Tomita) and Dad (Keong Sim) eventually came around, encouraging countless Asian American teenagers to consider pursuing non-traditional career paths. November: Grade A Jerk Award to Brett Ratner for portraying actress Olivia Munn as someone who tried to sleep her way to the top. The director, who offended the industry by his “rehearsal is for fags” comment, later apologized for making up the story about Munn… after he had to resign as producer of the Academy Awards. Hero Award to Maria Kwong for finally accomplishing what many had failed to do for decades: Persuade Universal Television to allow “Farewell to Manzanar” to be available on home video. The 1976 made-for-television movie can be obtained from the Japanese American National Museum for $25. Advocate II Award to David Ono for his excellent half-hour special “Witness American Heroes: Nisei Soldiers.” The KABC-TV anchor went to France and Germany, showing us where the 100th/442nd liberated Bruyeres and where many died in rescuing the Lost Battalion. Ono made history come to life, connecting often-told stories to the actual places as they exist today, bringing a chill to at least this viewer. December: Voice for the Forgotten Award to Frances Kakugawa, whose excellent book “Kapono: Memoir of a Modern Pompeii” resurrects the town that was covered by lava in 1960 and chronicles her struggles to rise beyond her pidgin English roots to become a teacher and writer in both hilarious and haunting stories. What Are You Waiting for? Award to the Top Four Television Networks: ABC, CBS, NBC, and Fox. After 12 years of meetings with the Asian Pacific American Media Coalition, only two series ever starred Asian Americans (“Cashmere Mafia” with Lucy Liu and “Dance War: Bruno vs. Carrie Ann [Inaba]”). The APAMC publicly issued a challenge that each network create at least one series starring an Asian American in three years — by fall of 2014. Bachi ga Ataru III! Award/Alexandra Wallace Follower? Award to Lia, the Irvine Chick-fil-A cashier who wrote “Ching” and “Chong” on the receipt of Kelvin Lee and his friend, who complained to the manager and got her (deservedly) fired. General: Can’t Teach an Old Dog New Jokes to Jay Leno for continuing to make cracks about Asians eating cats or dogs. The latest: “The economy’s so bad, my dog sold my cat to a Chinese restaurant!” Coming on the 2012 menu: The long-threatened meeting between the comedian and yours truly. How Many White People Are Enough? Award to the producers of “Hawaii Five-0” for constantly using white actors to guest star, many of whom hang out with the team (Larisa Oleynik, Lauren German, Terry O’Quinn, Greg Grunberg, Tom Sizemore, et al) and not using enough local actors — to give the series a true Hawaiian flavor — except mostly as suspects, villains, or dead victims while viewers are made to feel for white victims (who survive) and their relatives. This season, many scenes featured nothing but white cops and Grace Park was severely under-utilized. On top of that, they installed a black governor (has a black person even been elected to city council on Oahu?). The message sent to viewers: The producers don’t have confidence in their own cast to carry the show and haoles rule the 50th state. Arigato V Award to Phil Shigekuni for writing sensitively about gay and other sociopolitical issues and Wimpy Hiroto for sharing his honest feelings about growing older, moving to the Keiro Retirement Home, and surviving scary medical problems. Till next time, keep your eyes and ears open. And Happy New Year.